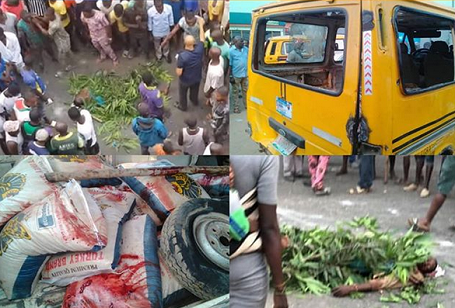 There was pandemonium in Abule Egba in the early hours of today following the killing of a rice smuggler by suspected Customs officers. The customs officers had chased the rice smuggler to Abule Egba in the early hours of the morning before shooting him dead and ran away. The body of the deceased was seen lying on the ground shortly after the incident while bags of rice that were smuggled were seen inside the danfo bus, with registration number Lagos/RKY/1953506. Stains of blood was seen on the body of the bus and some bags of rice as well. Irate youths burnt tyres and blocked the express road in protest over the killing.